On behalf of the Government and the Ministry of Education, Employment and Gender Affairs, I would like to wish all women in the Cayman Islands a happy International Women’s Day. The Government is pleased to support this year’s theme “Planet 50-50 by 2030: Step It Up For Gender Equality”, as chosen by the United Nations, because it is one that speaks to action, advancement, building momentum, and acceleration towards gender equality. As an administration, we are committed to addressing the most pressing barriers for women, issues such as increasing investment in gender equality, reaching parity for women at all levels of decision-making and disavowing and changing social norms that perpetuate discrimination and violence against women. Today, and indeed throughout Honouring Women Month, women, men, boys and girls in the Cayman Islands will be given many opportunities to participate in events that demonstrate the need to acknowledge gender equality, both where it exists and where it is lacking. I urge everyone to take advantage of those chances to “step up” and be challenged, empowered and changed. The term gender equality does not just apply to women in the board room; it reaches into our classrooms and on to our playgrounds. It belongs to little girls and young women who want to pursue careers in science, math, engineering, politics, construction, and computer technology in a society that largely still contends that these are fields to be pursued by males. By the same token, it also relates to a growing number of men taking on the responsibility of caring for children as their female partners work, and breaking down other traditional gender stereotypes that have dictated the specific roles of men and women in the home. Indeed we must be conscious that gender equality speaks to men and women being valued equally as opposed to being the same. You may ask, “How have WE in the Cayman Islands stepped it up for gender equality?” Well today, on the occasion of International Women’s Day, I am excited to announce that the Cayman Islands Government’s request to have the Convention on the Elimination of All Forms of Discrimination against Women (commonly known as CEDAW) extended to us was approved last week by the United Kingdom. Described as an international Bill of Rights for women, CEDAW was adopted in 1979 by the UN General Assembly and has been ratified by almost every single member of the United Nations. This decision is the culmination of a 12-year quest to receive the treaty, with the last application being made by this Government Administration in December 2013 to the UK Government Equalities Office via Her Excellency Governor Helen Kilpatrick. Over the years, the Cayman Islands Government has made commitments and participated in exercises to work towards having CEDAW extended to us. 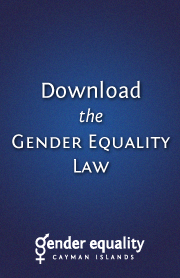 The passage of the Gender Equality Law was a major step forward in the process of meeting the UK’s requirements. 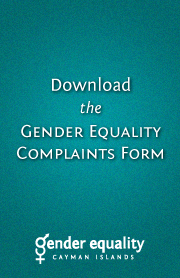 That law prohibits discrimination in employment and related matters and also serves as local “enabling legislation” that upholds the principles of CEDAW. This is a pivotal and historic step in the advancement of women and gender equality in the Cayman Islands. As Minister for Gender Affairs, and a woman, I am delighted to receive this news, especially as we are celebrating International Women’s Day, a time when we honour women for their valuable contributions to society, the workplace and our country. The United Kingdom’s request to the United Nations for CEDAW to be extended to the Cayman Islands has been a long standing aspirational goal for the Government, and we have now achieved it. This imminent extension validates the work we have already been doing to ensure equality between women and men and promote a culture of human rights in the Cayman Islands. Our desire to have CEDAW extended to the Cayman Islands is a reflection of our mission to create a more positive and equitable future for our sons and daughters and a healthier and more productive society. On behalf of the Government, I say congratulations to the team from the Gender Affairs Unit, Cabinet Office and Attorney General’s Chambers who over the years have tirelessly worked towards completing the necessary requirements of the UK’s Government Equalities Office in order to achieve the imminent extension of CEDAW. I, along with the Minister for Community Affairs, Youth and Sports, the Hon. Osbourne Bodden, also take this opportunity to commend the dedicated staff of the Family Resource Centre, Department of Sports, Cayman Islands Crisis Centre, and other Government entities and Non-Governmental Organisations who work- not just during Honouring Women Month - but on a daily basis assisting women during difficult periods of change or crisis; empowering girls, women, young parents and families with information and education; and promoting gender equality in our society. Today, thousands of events are being held throughout the world to inspire women and celebrate achievements. In the Cayman Islands, we are using International Women’s Day as a platform to inspire women and men alike to make a difference in their communities, stand up for justice and change and be a voice for those who cannot speak for themselves. We also want to show appreciation for those women in the community that continuously strive to better our Islands for all. There will be a variety of activities taking place throughout March to celebrate Honouring Women Month and help us advance the cause of gender equality. I encourage everyone to visit the Family Resource Centre’s Facebook page for information on upcoming events. Society cannot change overnight and minds do not change organically. With the advancement of technology and social media, the power of corporate, social and grassroots initiatives, and the voices of supportive men and women willing to speak out on issues concerning gender equality, everyone can be an advocate for change. Indeed a collective effort is necessary when striving towards gender equality, and the mutual benefits that it yields will ensure that the future for our girls is bright, safe, rewarding and valued as equally as our boys. I close with a quote by UN Secretary General Ban Ki-moon who aptly said, "Let us devote solid funding, courageous advocacy and unbending political will to achieving gender equality around the world. There is no greater investment in our common future." 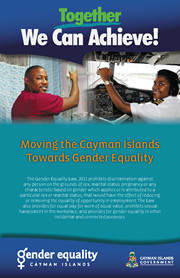 Thank you, and may we all continue to work toward gender equality in the Cayman Islands.